A major investigation by InDaily published this week revealed that Stephen and Angela Thomas – believed to be husband and wife – were accused in Parliament of criminal corporate behaviour as early as 2002. Yet they have built a vast network of related businesses since then, including several that have collapsed, leaving a devastating trail of unpaid debts – in the hundreds of thousands of dollars – to tradespeople across South Australia. InDaily can now reveal that Stephen Thomas is also the director of Alliance Investment Group – which introduces clients “to particular property investment opportunities that will assist them in creating wealth and providing for their retirement” and urges families to invest in a “select group of building companies that have met stringent criteria”. Stephen Thomas has been removed from the “Meet the Team” page on the Alliance Investment Group website since InDaily contacted him for comment before we published the investigation. However, his name and photograph still feature in a brochure on the website, which spruiks the merits of Angela Thomas’s SA-based construction companies, Panoramic Homes SA and Omega Homes SA. The brochure claims the companies “finish their homes to a high-standard with excellent value for money”. Connor Thomas, who is listed in ASIC records as living at the same address occupied by Stephen, Angela and Joshua Thomas, is also registered as Alliance Investment Group’s first director, running the company for just over a month last year. Panoramic Homes and Omega Homes were both stripped of their building licences by SA corporate watchdog Consumer and Business Services before they were forced into liquidation by court order in October 2018 and last month, respectively. A report to creditors by liquidator Stuart Otway, obtained by InDaily, says: “Panoramic, along with another company Omega Homes SA … were set up to take over and complete a number of building contracts entered into by related building companies Liberty Homes Australia and / or InFocus Homes”. “I am advised that InFocus was the subject of a complaint to Consumer and Business (Services) which led to an investigation which expanded to all of the companies. Liberty Homes fell into liquidation owing $451,042 to 41 unsecured creditors. Panoramic Homes fell into liquidation owing $298,743 to 31 unsecured creditors. InFocus Homes fell into liquidation owing $485,955 to 68 unsecured creditors. The financial and personal damage inflicted on local subcontractors by the collapse of Omega Homes is not yet clear. CBS has confirmed to InDaily it is investigating Liberty Homes and “related entities”, although it declined to confirm which. 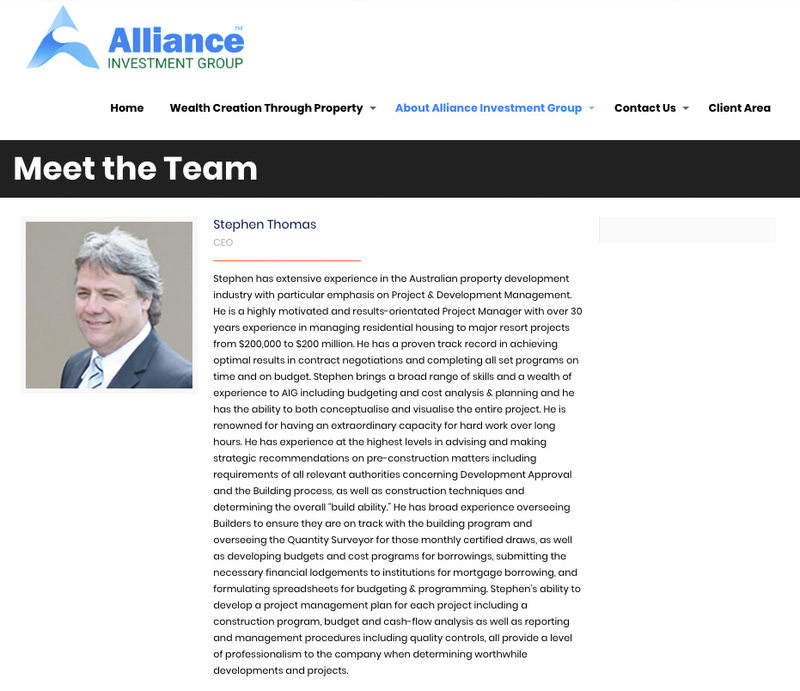 The “Meet the Team” page on the Alliance Investment Group page had featured a lengthy description of CEO Stephen Thomas. In it, he was described as “a highly motivated and results-orientated Project Manager with over 30 years experience in managing residential housing to major resort projects from $200,000 to $200 million”. InDaily saved the page on internet archive WayBack Machine on February 7 (you can see the snapshot here) and the description still appeared on the Alliance Investment Group website as late as Friday last week, but has since disappeared. A lengthy description of Stephen Thomas as CEO was at the top of the “Meet the Team” page on Alliance Investment Group’s website until recently. 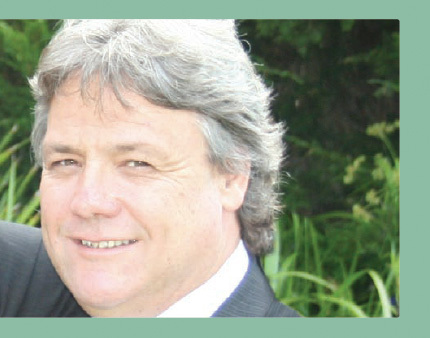 A photograph of Stephen Thomas that features in the Alliance Investment Group brochure. The brochure promotes two of Angela Thomas’s now-collapsed SA construction companies. Phoenix activity, as defined by national regulator ASIC, is when the director of a company tries to avoid paying its creditors, often by moving assets into a second company before the first company is liquidated. “Joshua Thomas” is listed on the “Meet the Team” page as “office manager”. Joshua Aaron Thomas, 25, was the director of InFocus Homes. The exact connection he has with Angela and Stephen Thomas is unclear, although Otway’s report also says the directors of the four companies are Angela Thomas “and her and Stephen’s children”. According to national corporate watchdog ASIC’s records, Joshua Thomas lives at the same Toowoomba home address as Angela Thomas and Stephen Thomas – an address also listed as the headquarters of more than 20 companies of which they have been office holders, or shareholders. “I hope that Mr and Mrs Thomas will, at the very least, be banned from being company directors for a very long time so that they cannot continue to profit at the expense of honest subcontractors,” then-Labor MP Dr Leslie Clarke told the chamber. During the speech, she also accused Stephen Thomas of acting as a “puppet director” for a company whose registered director was Angela Thomas and which owed creditors more than $1 million, and said both were being pursued by authorities in relation to insolvent trading and criminal corporate behaviour. InDaily contacted Stephen Thomas and Joshua Thomas for comment on this story, including asking whether it was appropriate to promote Panoramic Homes SA and Omega Homes SA to investors. Did Alliance Investment Group make the connection to Angela Thomas clear to investors? Why was Stephen Thomas’s name, photograph and description removed from the “Meet the Team” page? What association does Joshua Thomas retain in his role with Alliance Investment Group?